On Thursday, Tennessee became the only state in America to authorize forced electrocutions. Tennessee Governor Bill Haslam signed a bill Thursday permitting prison officials to use the electric chair to execute death row inmates in the event that lethal injection drugs are unavailable. The bill makes Tennessee the only state authorizing electrocution as a potential default method of execution. Eight other states allow the use of the electric chair, but only if inmates choose it over another method, usually lethal injection. We spoke with Dr. Austin Sarat, professor of jurisprudence and political science at Amherst University, about what this means for Tennessee and capital punishment in the United States. Sarat is the author of Gruesome Spectacles: Botched Executions and America’s Death Penalty. Steven Hsieh: What happens when an electrocution goes awry? Austin Sarat: The problems with the electric chair run from merely technical problems to problems with gruesome results. One problem with the electric chair is, on occasion, the voltage of the electricity isn’t sufficient to kill the condemned. A classic example happened in Louisiana in the 1940s when a condemned man named Willie Francis was to be put to death by electrocution. The voltage of electricity administered was not enough to kill him, and after passage of some time, he was removed from the chair, brought back to the jail and a second effort to execute him was scheduled. He contested that second execution attempt, but the US Supreme Court allowed it to go forward. On the other end of the continuum, the electric chair has resulted in people catching on fire. That became a particular problem in Florida in the 1970s and early 1980s. Indeed the first electrocution in the United States, carried out in New York, the execution of someone named William Kemmler, was also botched in a rather gruesome way. What is the more humane execution method: electrocution or lethal injection? That is the wrong question. It assumes that it is possible to ensure that an execution will not be botched. I’ve studied every execution between 1890 and 2010 to determine how reliable, safe and humane the methods have been. If you look at every execution over that period of time, approximately 3 percent of executions were botched. If you look at just lethal injection, slightly more than 7 percent in the United States has been botched. In every turn, as we’ve thought about the methods by which we put people to death, the same promises have been made. Go back to the nineteenth century and you look at what proponents of the electric chair said. They said it’d be safe, reliable and humane. If you move forward in the early twentieth century when the gas chamber was authorized and first used in Nevada, proponents of the gas chamber said it would be safe, reliable and humane. If you fast forward to the late 1970s, when Oklahoma became the first state to authorize death by lethal injection, the proponents of lethal injection said it would be safe, reliable and humane. So, I don’t think we’ve found, or are likely to find, a method of execution in which the technology will ensure us that things won’t go wrong. We know that failures will happen. We don’t know when. We can’t predict them, necessarily. What has happened is botched executions are regarded as mere accidents. But if we look at a broader picture of these “mere accidents,” we see that they happen with unnerving frequency. 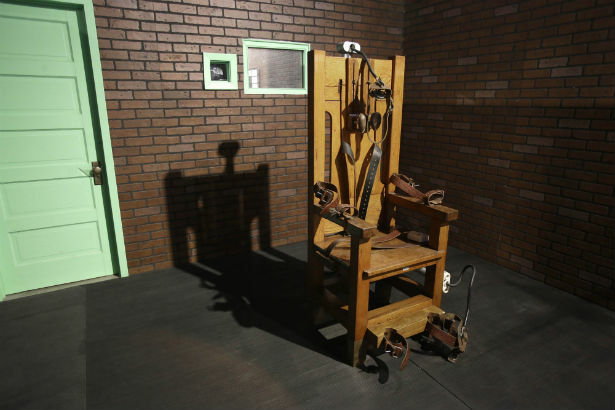 Tennessee’s effort to bring back the electric chair seems like an act of desperation. What’s going on here? What’s happening in Tennessee has to be seen in the broad context of what’s happening with the death penalty in the United States. We’re in a period of national reconsideration of capital punishment in this country. We’re in a period where proponents of capital punishment are on the defensive. If you go back to the late ’90s, about 300 people a year were being sentenced to death. That number has been cut by almost two-thirds. Increasingly, Americans look at the death penalty not as an abstract moral question but as a question about whether the death penalty system actually works. We’re increasing our doubts about the capacity to differentiate the guilty from the innocent, our capacity to determine who among the guilty actually deserves the death penalty, and now our capacity to execute those who we determine to die in a way that is compatible with the Eighth Amendment’s commitment that punishment should not be cruel. What Tennessee is doing is a further symptom of a death penalty system in disarray. After all, the legitimacy of the death penalty in the United States has, over the course of the last century, depended on the promise of scientific progress, such that we could find a method of execution that would be safe, reliable and humane. Going backwards, it seems to me, will further unravel and discredit the system of capital punishment in the United States. Were Tennessee carry out an electrocution, they would be running the risk that execution would be botched in ways that are even more gruesome than what happened in Oklahoma. This bill would allow the corrections department to force electrocution on the condemned. Do you think this would fly legally? More than twenty years ago, in the face of a series of botched executions in Florida, a constitutional challenge was brought to the US Supreme Court alleging that electrocution should be declared unconstitutional. So concerned were public officials in Florida that the Supreme Court would strike down the electric chair, that the state enacted a bill to change its primary method of execution to lethal injection. I think that if the state of Tennessee went forward with a series of electrocutions, there would be a series of legal challenges, which would have a very substantial prospect of prevailing. Nebraska’s Supreme Court, some years ago, declared electrocution to be unconstitutional. If electrocution were to be used, it would actually damage the prospect of survival in the United States. Will America ever abolish the death penalty? We’re already on the road to abolition. This period of national reconsideration has refocused the attention of Americans on the death penalty. It’s changed the question. The question used to be focused on the condemned, those we punish. Today, the question is, “Can we impose death penalty in a way that doesn’t damage central American values?” After all, you can be favor of the death penalty in the abstract, but be reluctant to execute the innocent. You can be in favor of the death penalty in the abstract, but be reluctant to impose it because of the race of the offender or race of the victim. You can be in favor of the death penalty in the abstract, but appalled at how costly it is to carry it out. You can be in favor of the death penalty in the abstract, and be repulsed by the idea that when we put someone to death, we can’t do it in a way that is humane. I think abolition will happen in the United States. It will happen slowly, and not without some reversals—a kind of two-steps-forward-and-one-step-back process.